In any residential establishment, a lot of dirty linen accumulates in the various units and departments. It is essential to ensure a continuous supply of linen, which is well laundered, so that operations can be carried out smoothly and efficiently. Linen is an expensive item, so how it will be laundered requires serious consideration. People involved in handling linen should have some knowledge of the process. Moreover, the Housekeeper and Linenkeeper should have a good rapport with the Laundry Manager. Although it is essential that good quality linen be purchased, the life of the linen depends on the care of linen in use and the treatment it gets at the laundry. 1. Careful handling of linen articles while laundering. 2. Correct processing and use of a suitable laundry agent. 4. Proper counting and records maintained to avoid shortages of linen. 5. Speedy operations to meet with operational requirements. 6. Sound policies regarding damages or loss. A commercial or off-premises laundry refers to laundering activities performed outside the establishment i.e. given on a contract basis to specialists in the field. In a rare circumstance, the laundry is contracted and on-premises. An on-site or on-premises laundry, however, refers to laundering activities carried on within the establishment by staff employed by the hotel. • Time taken for laundering is reduced because transportation is eliminated. • Linen is readily available especially in the case of emergency requirements. • Control over the wash process and the laundry agents used making the wear and tear on linen comparatively much lesser. • The ‘par’ stock required is reduced. • Revenue is earned from guest laundry. • Cost of equipment and its maintenance is fairly high. • Related expenses like printing of forms, employee taxes, water taxes, energy costs and insurance are high. • More staff that is technically qualified and adequate space is required. • Must be justified by an adequate amount of linen. Collection of linen may be done in the Linen Room, if the laundry is off-site but is usually in the laundry itself, if the laundry is on-premises. During collection, all accessories that cannot be washed such as metal items; epaulettes, etc. should be removed at the time of collection. Certain linen items are collected separately. For example, kitchen uniforms or dusters are separately collected, as are butchery aprons and dusters, because they have a specific type of soil. Likewise, in a hospital, linen from the surgical ward would be collected separately. The linen is usually packaged in canvas bags lined with polyvinyl. Eyelets on the rim of the bag facilitate passing a nylon cord through, which can be tightened in order to shut the opening of the bag. In some cases elasticized net bags called ‘skips’ are used to collect linen. Carrying the linen in canvas bags or skips is one means of transportation. Trolleys are most popular for transportation and the collapsible wire cart can be used to transport clean as well as soiled linen. Whatever the type of trolley, the soiled linen should not hang over the edge of the trolley, as it looks unsightly. If planned at the construction stage, an in-built chute is used for transporting linen from the floor pantries. It is preferable to put linen into canvas bags before dropping it down the chute so that wear and tear is reduced. However, this is rarely done, so it must be ensured that the flooring at the base of the chute should be easy to clean. The best collection system will vary from one operation to another but the increase of soil must be eliminated in order to prevent incurring unnecessary expenses. On arrival, linen must be dealt with as quickly as possible. There must be a separate section for guest laundry that is usually handled by the most experienced staff. 1. To ensure that linen items are available as and when required. 2. To avoid transfer of stains and prevent stains from becoming permanent. 3. So that it does not provide a breeding ground for bacteria and pests. 4. To prevent the formation of mildew on damp articles particularly bath linen. 5. To avoid the possibility of linen getting misplaced or lost. In hospitals, the infection risk necessitates the need for using gloves when sorting out linen. Gloves may also be used when handling hotel linen. Sorting is carried out according to the type of fabric and item, colour as well as the degree and type of soil. Sorting is done to separate those articles that need dry cleaning from those that will go through the normal wash process. Those that need mending or stain removal will be separated so that they can be dealt with accordingly. Also, different articles take a different wash process in terms of temperature of water, type of laundering agent, length of wash cycle, whether hydro- extraction should be done and if so, the length of the hydro-extraction cycle. It takes less effort to pre-sort linen than to post-sort washed linen which is 50% heavier in weight due to water retention. Post-sorting is often essential in healthcare processes. Marking may be temporary (guest laundry) or permanent (monogramming of hotel linen). It is the temporary marking that is carried out at this stage. Most good establishments have a marking machine that attaches a heat sealed tape in an inconspicuous place. The tag has scope for six characters and is intended to indicate the initials of the guest as well as the room number. It provides a clear identification and correct billing, and although it does not come off in the normal wash process, it can be peeled off if so desired. Is carried out to conform to the capacity of the washing machine. There is no or low centrifugal action because the linen articles are too tightly packed in the drum. Resultingly, there is inadequate friction and the deeply imbedded soil is not removed so the wash process is ineffective. Certain synthetics develop creases as a result of overloading that are difficult to get rid of in the subsequent ironing process. Repeated overloading can cause the machine to breakdown. In this case, there is centrifugal action but inadequate friction because the linen articles are too far apart. There is a good deal of wastage in terms of time, labour, laundry agents, water and power. Many modern machines have sensors that can gauge not only the load but also the length of cycle, temperature of water, water level, the type and amount of laundry agent and when it will be dispensed in the wash cycle. This is highly beneficial in the conservation of water and energy as well as reducing wear and tear on the linen articles. Is often done manually or with a certain degree of automation. Where handling is taboo, a fully automated system exists. Shovel type cranes are used for lifting and depositing linen, thereby providing complete automation by eliminating the need for handling by operators. Alternatively, weighed linen in bags is transported along a track and directed to the opening of the washer extractor with the help of a nylon cord. A lock in the lower half of the bag is released, dropping the soiled linen into the washer extractor. Machines that tilt, provide ease in both loading as well as unloading. Machines may be top loading, front loading or side loading. If the cycle is too short, the linen will not be cleaned. If the cycle is too long, there will be unnecessary wear and tear and the clothes may actually become dirtier as a result of redeposition of soil. If the temperature of water is too high, it is likely to damage the linen. If the temperature is inadequate, the chemicals will not work effectively. Incorrect ‘dip’ levels can alter the concentration of the laundry agents rendering them ineffective. In case of a gentle action the water level is usually higher forming a protective envelope to the delicate linen. This is also a crucial factor that affects the quality of wash deciding which laundry agent should be used is dependent on the nature of the fabric being washed. Too little detergent will result in an incomplete cleaning process. And too much may remain as a residue after the rinse cycle is complete. It is important that the laundry agent is introduced into the wash cycle at the appropriate time if it is to have the required action. causes friction between the linen articles and is radically affected by overloading or underloading as well as the speed of the drum. Modern machinery often operates on sensors, which are capable of gauging each of these requirements for a specific load. ironing or irritate the skin. reducing the temperature of water in consecutive rinses. A running rinse with an open drain is more effective but a larger volume of water is utilized. drying time and may hinder the proper operation of finishing equipment. The most efficient extraction for cottons takes place at temperatures higher than 38º C but lower than 55º C so that they are not too hot to handle. Polyesters and blends should be extracted at a temperature below 38º C to prevent wrinkling. The compact mass of hydro-extracted clothes is referred to as ‘cheese’. Transferring washed linen from the hydro-extractor to the Tumble Dryer is a difficult task because of the added weight of moisture. Articles may be manually removed and put into trolleys. Tilting and dumping machines reduce the physical effort of manual unloading. A laundry cart can be positioned under the door and a push button operated to rotate the cylinder and empty its contents. Alternatively, the machine can unload onto a conveyor belt that will transport the linen to the next set of operations. This process is capable of rendering the linen completely dry by blowing hot air ranging between 40º C to 60º C onto the articles as they are slowly circulated in the rotating drum. For articles that are susceptible to damage by heat, there is the option of simply airing by circulating air at room temperature. To avoid wrinkles and the risk of spontaneous combustion, many dryers have a cool-down cycle at predetermined intervals. The process of tumble-drying creates a good deal of wear and tear on the fabric as particles of lint come off the fabric in the drying process. The time taken is approx. 30 mins. depending on whether the article is to be completely or partially dried. For those articles that require a pressed finish, ironing and pressing are usual, but there are also other finishing equipment. Articles like blankets, towels, candlewick bedspreads, hosiery, etc. that do not require a pressed finish are only tumble-dried. Can be done by machine but in most cases is carried out completely manually or at least the finishing folds are done manually. The use of a folding stand helps minimize this otherwise very labour-intensive operation. Manual folding makes it possible to achieve the desired fold as well as ensure quality control. Employees in this area are the one ones who ‘reject’ stained linen and are a good source for ascertaining what types and quantities of stains commonly occur. This is an important stage in the processing of laundered linen as it can be the ‘bottleneck’ in an otherwise efficient laundry operation. Correct folding is important to the appearance of the article and makes it convenient to store and use. This is essential prior to storage, especially if the articles are to be stored in closed shelves. It ensures that any moisture that is likely to cause mildew will be got rid of. The linen is issued to the unit/department for use. Since transfer of clean linen is usually done by linen trolleys, it is important to keep the trolleys clean. The linen is utilized for the necessary function intended and the cycle begins all over again. A complete wash cycle is composed of various stages and the time taken is approx. 40 to 50 minutes. It has been proven that quick wash cycles using large volume of water broken down into the following sequence is most effective. A washing machine, or washer, is a machine designed to clean laundry, such as clothing, towels and sheets. The term is mostly applied only to machines that use water as the primary cleaning solution, as opposed to dry cleaning (which uses alternative cleaning fluids, and is generally performed by specialist businesses) or even ultrasonic cleaners. supplied by the temperature of the wash bath. timesaving, thereby reducing staff requirement. There are also significant energy and water savings. Tunnel washers can also be hooked up to an extractor and subsequently with conveyors to the dryer. length of the drying cycle is dependent on the absorbency of the fabric and the residual moisture. Modern dryers are equipped with high tech features such as signal lights, self-cleaning lint screens, reverse cylinder drums as well as energy-saving devices like extra insulation and heat reclaimers. A) Flatwork Ironer / Roller Iron / Calendar: Is used for flatwork i.e. items like sheets, pillowcases, tablecloths, serviettes, aprons, sarees, etc. The items are passed through heated rollers for ironing. B) Press: Press is used for fine pressing of Flat Linen like Table covers, Pillow covers, Napkins, Kitchen linen, Staff uniforms. They are special presses to perform specific functions and operation can be on electricity or steam. For coats and articles that do not crease heavily. The articles are put onto a dummy that is inflated with steam to remove creases and then with hot air to remove the moisture created by the steam. Clothes are hung on conveyor belts that pass through a tunnel. Hot air blowing in the tunnel, renders the articles completely dry by the time they exit. It is a fully automated process that also transfers the linen to the next area of activity. Is a chamber where low-crease garments are suspended on hangers and steam or hot air is circulated through the cabinet. properly, taking into account ease of each operation. 3. Space between adjacent machines and adequate space between the back of the machine and the wall which is essential to facilitate servicing and repair. 5. Water supply at the rate of about 10 gallons per Kg of linen approx. 6. Preventing the occurrence of ‘water hammer’ from hotwater supply water heating is through solar energy. 11. A separate section to deal with guest laundry / valet service. 12. Local code for restrictions / permit requirements. 14. Selection of equipment to suit the premises and projections. As technology strives to automate every face of hotel operations, computerized laundry systems are getting popular. Water by itself is ineffective as a cleaning agent, due to a phenomenon known as ‘surface tension’. It although removes water-soluble dirt, it has little effect on oils and grease. Addition of a detergent allows the water to penetrate, wetting the garment thoroughly so that soil is more accessible and its easy removal. The role of the suspending agent in cleaning is to hold the dirt in suspension and prevent it from redepositing onto the surface of the clothing. The suspending agent is carboxyl methyl cellulose. responsible for temporary hardness in water. Sodium polyphosphates are used as sequestering agents. This is a scale used to determine the pH of sud in the washing so that it may be possible to adjust the pH of the sud with the use of chemicals to maximize cleaning efficiency. b) Bleaches: These are used on white articles only. They remove colouring matter by their oxidizing or reducing action. If not in liquid form, they should be dissolved in hot water andadded. The bleaches commonly used in the laundry process are sodium perborate and sodium hypochlorite. c) Antichlors: These are agents used to neutralize the residual chlorine in the bleach, particularly in the case of polyesters. The use of chlorinated bleaches has a tendency to leave yellow deposits on the clothing. d) Sour: This is used only in industrial laundering in the final rinse, to neutralize any alkaline soap residues that may be present. It brings the pH to the acidic range between 5 and 6.5, which is agreeable to the human skin and also gets rid of yellow or brown hue caused by alkali residue. Acetic acid is used as the sour. In case where there is a high iron content in the water, Oxalic acid is used to get rid of the reddish, iron deposits. If starch is being used, sour should be added only two minutes before the starch to achieve a pH of 5.0 to a sizing agent is being used, the ideal pH is 7.0 to 8.0, so sour is generally not used. fluorescent effect by reflecting the UV rays of the sun. The laundry blue in a powder form is undesirable since it tends to accumulate in the weave of the fabric and causes it to turn grey. essential for napkin folds. Since polyesters do not have the ability to absorb starch they are stiffened with sizing agents. g) Fabric Conditioner and their Role in Laundering: A fabric conditioner or softener has surface active agents like a detergent but they do not perform the function of cleaning. Fabric conditioners are based on cationic surface-active agents, carrying a positive charge and creates anti-static properties. A fabric conditioner is never used on loads where starch or sizing will be used. The solvent after dry cleaning is removed first by centrifugal action followed by evaporation. The solvent being expensive is filtered off and recycled. Darker coloured articles are dry-cleaned after the lighter coloured ones. All articles require to be aired after the dry-cleaning process. Where Per-chloro-ethylene is not suitable, a system called Aquatex (from Iowa Techniques) is used. It involves the use of bio-degradable chemicals and water and a controlled stage-by-stage drying temperature that restores the article to its original condition. As technology vendors strive to automate every face of operations, computerized laundry systems have been in use since the mid-eighties. Some hotels are experimenting with Windows based laundry software and ozone washing. G.A. Braun has developed a cutting edge, interactive PC video-conferencing product called Serview that enables qualified technicians to provide customer and support service through contemporary two-way high speed audio and video conferencing. Ozone is a powerful oxidizer and ozone washing is an energy efficient system that can cut laundry costs by 50%. Ozone washing became popular in the US in the mid-eighties. It is carried out by mass injecting ozone into the laundry system via the cold water lines. The resulting ozonated water facilitates the breakdown of insoluble dirts leading to a whole host of benefits. Ozone washing, the brainchild of GuestCare Inc., cuts detergent use by 60%. It reduces the need for hot water and can cut energy costs by 80%. Little hot water, reduced chemicals and shorter wash cycles greatly extends the life of linen. facility for ironing is required as clothes get crumpled in packing. It is a source of revenue in hotels and may serve as a means of preventing the guests from washing clothes and hanging them out to dry in hotel guest rooms. Laundry service, including dry cleaning may be normal (ordinary) or urgent (express). 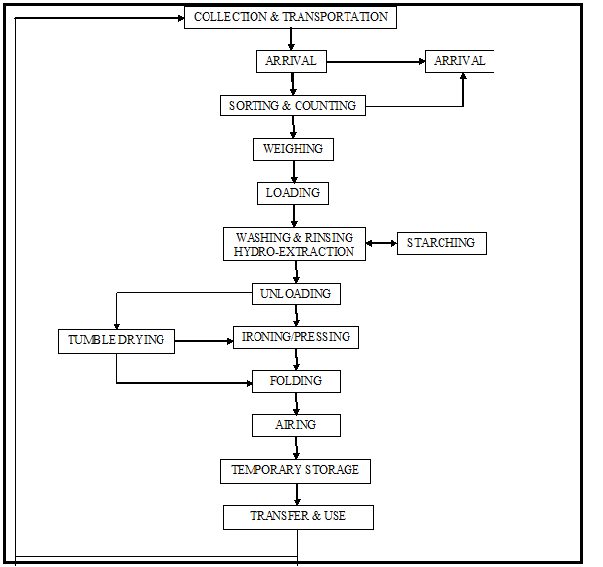 The time gap between the collection and delivery is dependent on whether the laundry is on-premises or off-premises. separate clothes that tend to produce lint (towels, sweatshirts, chenille and flannel) from clothes that tend to attract lint (corduroy, velvets and permanent-press clothes). Step 2: Close zippers to prevent snagging, and empty pockets. Step 3: Pre-treat heavy stains with laundry detergent or stain remover, heeding instructions on the product label. Step 4: Measure out the right amount of laundry soap according to the manufacturer's instructions. Step 5: Pour the soap into your washer or its detergent dispenser. Add liquid fabric softener, according to product instructions. Step 6: Choose the water temperature for the wash cycle: hot, warm or cold; use cold rinse cycle for any load. Consult the labels on clothes, washing machine's instruction manual or the detergent container for recommendations on washing temperature. Step 7: Start the washer, add and allow the detergent to dissolve in the water before adding clothes. Adjust the water level to the size of load. Step 9: Add the clothes, close the lid and let the machine run. Washing takes approximately 45 minutes. Step 10: Put the clothes (and an anti-static sheet, if desired) in the dryer after the wash is complete. Hang delicates (such as bras and certain sweaters) to air dry on a clothing rack or hanger. Step 11: Remove lint from the dryer's lint tray. Step 12: Select the correct drying temperature for the laundry load: low for delicate, medium for most fabrics and high for cotton. When in doubt, low or medium is the safest bet. Step 13: Close and turn on the dryer. Expect the drying cycle to take an hour or more for a full load. Step 14: Once the clothes are completely dry, remove them from the dryer or drying rack and fold and store.